1. Identify and recruit enough of the right people as operating committee chairmen. 2. Initiate plans and helps committee chairmen recruit an adequate number of members to carry out the functions of the district. 3. Plan (with the district executive) and preside at district committee meetings. 4. Work with the district commissioner and district executive to stimulate and to coordinate the work of the district, to ensure the success of the Scouting units. 5. In cooperation with the district executive, ensure the completion of district goals. 6. Represent the district on the council executive board, once elected. 7. 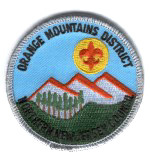 Recognize individuals, committees, and chartered organizations for their Scouting accomplishments. 8. Support local and national Scouting policy, procedures, and practices. 9. Help to secure support for Scouting from top community leaders throughout the district.